Social media is one of the best places to start promoting your webinar if you’re starting from scratch and don’t have a line-up of joint venture partners and you don’t have a mailing list. Since most social media users have an average of 140 contacts, it is a good place to start when wanting to market your webinar. The most common way to promote a webinar is by simply publishing a post and making an announcement such as: “This Thursday, at 7pm EST I’ll be running a live webinar on how to build and manage a successful sales team, register here: LINK”. This method can be effective as long as your organic reach is high and you have a large enough and engaged enough audience, who is likely to also share your post with their contacts. In order to boost engagement, invite people to either tag their friends in the comments section who are likely to be interested in the webinar or simply invite them to share the post. Having one-on-one conversations on social media with people through private messages and direct messages is known to be very effective, note it is also very difficult to scale. You would need to have hundreds of one-on-one conversations with people in order to achieve your end result. Twitter is one of the easiest platforms to start one-on-one conversations, as all you need to do is add the person’s username right at the start of your tweet. However, sending too many similar direct messages including links can raise flags and lead to the suspension of your account, so make sure you do not include any links in your messages until the person actually responds and is happy for you to share your webinar registration link. When setting up your social media profiles, you’ll notice that you have multiple opportunities to insert your website url. One the banners for example (also known as headers) you can add a url, in your profile description as part of your bio and in the “website” section. Plus, Facebook also has the option below your banner to add a call to action tab, such as “learn more” which can redirect to your webinar registration page. Paying for advertising on social networks is probably one of the most effective ways to increase your webinar registrations. The biggest social networks such as Facebook, Twitter, Linkedin and Instagram now allow you to reach more people by simply paying for it. The key when using paid advertising is in the targeting and retargeting. At first, your ads might not perform very well as people will not recognise who you are when you appear in their newsfeed, and therefore not click on your ads. The secret is to then retarget the people who did click on your ads but didn’t convert into a registration. Success always comes from the follow up. Live videos have become very effective for marketing and social networks such as Facebook, Instagram and Twitter now allow you to easily broadcast your own live videos. In fact, live videos tend to have more organic reach than standard posts. In other words, by having a live video to promote your webinar, your chances of your video being watched is higher than your chances of your post being seen. The key to successful live videos is how much planning you put into them. You will need to outline first what you want to say, then rehearse it to make sure when broadcasting live, your delivery is flawless, straight to the point and confident. An effective live video to promote a webinar should start with a headline that is likely to catch your target audience’s attention. Then, it should include the benefits of attending the webinar, details of when the webinar will take place, and finally, a strong call to action. Social media influencers are usually self-made internet stars, well known in their industry, have high engagement levels on social networks, have authority and credibility in their industry and have large and specific audiences on social media. What this means, is that you can now partner with influencers in your industry for them to endorse your webinar. For example, should you have a webinar on how to improve golf skills, get in touch with a social media influencer in the golf industry (such as a golf blogger) asking him or her to consider promoting your webinar in exchange for something. When they do, your chances of increasing your webinar registrations are very high. Guest posting is the process of writing content on someone else’s social media profile. For example, some Facebook pages allow you to post content. What this means, is that anyone can have access to very large social media audiences. For example, should you be running a webinar on weight loss, and post content on a weight loss Facebook page with thousands of fans, your post could potentially be seen by thousands of people. 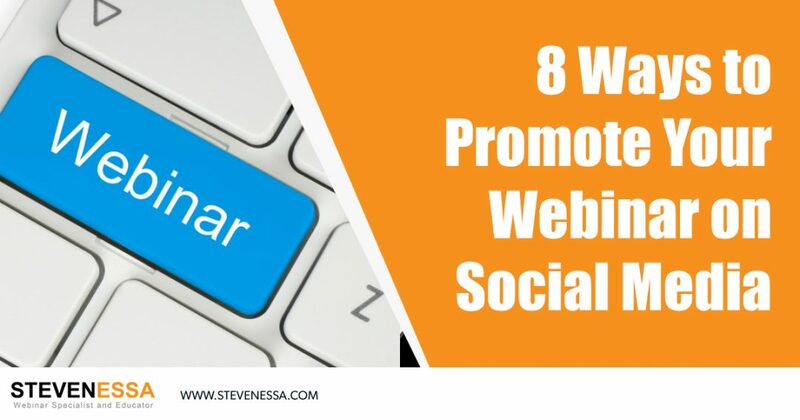 Although this strategy is very tempting, you’ll have to do it carefully because if you simply promote your webinar, it can be perceived as spam and frowned upon. Instead, publish a post that adds value to people, so they can then click on your guest post to be redirected to your page and see the webinar invitation there instead. Snip.ly is a link shortening tool which also allows ads to be displayed on the web page of the shortened link. For example, should you be promoting a webinar on real estate investing, you could source articles published online about real estate investing, shorten the link using snip.ly and publish it on your social media profiles. Then, when your social media audience members would click on the shortened link to read the whole article, your ad would also appear at the bottom of the web page. Your ad could simply consist of a sentence such as “Discover how to build a large property portfolio in under 3 years” and a call to action such as “click here to watch the webinar”.